Emirates launched its 11th destination in the United States with the start of a daily nonstop passenger service between Dubai and Fort Lauderdale-Hollywood International Airport today. A VIP delegation and a contingent of international media were aboard the inaugural flight, which carried passengers from North America, the Far East, the Middle East, South Asia, the Asian subcontinent and Africa. 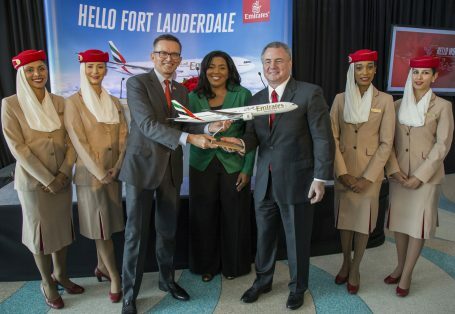 Fort Lauderdale is Emirates’ second destination in Florida, after launching Orlando more than a year ago. The new service, operated by a GE-powered Boeing 777, marks the first scheduled commercial service from the Middle East to Fort Lauderdale-Hollywood International Airport serving the South Florida area of Fort Lauderdale, Miami and West Palm Beach. With the launch of Orlando last year, the new service to Fort Lauderdale-Miami will provide travellers with more options for to make the most of their journey. The increased flexibility to business and leisure travellers, combined with the ease and convenience of flying into and out these two gateways, is expected to add significant visitor numbers to the State of Florida. “FLL is proud to welcome Emirates, one of the world’s premiere airlines to Broward County. This new service to Dubai, and ultimately to the rest of the world, will provide our community with tremendous business and travel opportunities. With an estimated annual economic impact to our region of more than $100 million and approximately one thousand new jobs as a direct and indirect result of Emirates arrival, we are confident this new service will mark the beginning of many more great things to come”, said Mark Gale, CEO/Director of Aviation. The new service will operate as flight EK213, departing from Dubai International Airport at 3:30 a.m. local time and arriving at Fort Lauderdale-Hollywood International Airport (FLL) at 10:55 a.m. The return flight, EK214, will depart FLL at 8:20 p.m, and arrive in Dubai at 7:40 p.m the next day, with a flying time of 14 hours and 20 minutes. The route will be operated by a GE-powered US-built Boeing 777-200LR aircraft in a three-class configuration offering 8 First Class suites, 42 Business Class lie-flat beds and 216 Economy Class seats for travellers, and up to 15 tonnes of bellyhold cargo for shippers. Passengers from the Middle East, Africa, South Asian subcontinent, and the Far East can enjoy quick and convenient connections in Dubai before they travel onwards to Fort Lauderdale. In particular, passengers from destinations such as Beirut, Doha, Riyadh, Cape Town, Johannesburg, Bangkok, Cebu, Singapore, Mumbai, Delhi, Chennai, Hyderabad, as well as Colombo and Karachi will experience connection times of less than 4 hours while in Dubai. Fort Lauderdale is one of the most popular tourist destinations in the United States thanks to its abundant sunshine and temperate weather. Its immaculate beaches and championship golf courses attract leisure travellers. Fort Lauderdale is also a popular destination for the cruise industry with Broward County’s Port Everglades one of the top 3 busiest cruise ports in the world with more than 4 million annual visitors. Emirates’ new route will also serve the South Florida area, including Miami and West Palm Beach. Just a 30 minute drive away, Miami is home to the largest concentration of international banks in the US and its metropolitan area is the eighth-largest in the US with a population of 5.5 million people. Hispanics and Latinos comprise more than 70 percent of the city’s population, and have created a cultural fabric that is unique to Miami. Miami is also one of America’s cultural meccas, famous for its exclusive take on nightlife, art, music, architecture and cuisine. Fort Lauderdale will be the 11th U.S. passenger destination Emirates serves, following on from Orlando which launched in September 2015. The airline has been serving the U.S. since 2004 and currently operates 119 passenger flights per week between Dubai and the U.S. Since 2004, Emirates has carried more than 16.1 million passengers on its U.S. flights and 740,000 tons of high value goods between the U.S. and Dubai. Emirates was named “World’s Best Airline 2016” at the prestigious Skytrax World Airline Awards. Whilst aboard the 14-hour, 20-minute flight, passengers can enjoy Emirates’ renowned service provided by a multilingual crew from more than 135 countries, gourmet on-board dining, complimentary wines, dedicated children’s menus and activities. Customers in all classes can enjoy Emirates’ multi-award winning ‘ice’ Digital Widescreen with more than 2,500 channels of movies, TV programs, music and podcasts. First and Business Class passengers can also travel to and from the airport via Emirates complimentary Chauffeur-drive service, making it easy and convenient for customers from Fort Lauderdale, Miami, Palm Beach and other South Florida cities to arrive on time, refreshed, and ready for their flight with Emirates. Emirates has carried more than 16.1 million passengers on U.S. flights since launching services to New York in 2004. The airline currently serves 11 U.S. gateways – Fort Lauderdale (FLL), Orlando (MCO), Chicago (ORD), Boston (BOS), San Francisco (SFO), Los Angeles (LAX), Seattle (SEA), Dallas (DFW), Houston (IAH), Washington (IAD) and New York (JFK), as well as operating a trans-Atlantic route between JFK and Milan and freighter services to Atlanta and Columbus. Emirates SkyCargo transports up to 650 tons of U.S. exports each week – including auto parts from New York, apples and cherries from Seattle, and oil and gas equipment from Houston – stimulating trade and opening new markets for American businesses across the Middle East, Africa and Asia.